Starting Outdoors: Direct sow 2-3 weeks before last frost. Sow in rows about 6-12" apart in all directions. Does best with full sun to partial shade in rich, moist yet well-drained soils. Harvest leaves for salads or cooked greens. Fertilizer: Scratch in a few inches of compost or dehydrated chicken manure prior to planting, or feed with a balanced, organically-sourced all-purpose fertilizer according to package instructions. Diseases & Pests: Fungal leaf spots can be unsightly but generally do no affect quality. Aphids, leafhoppers, and flea beetles can be troublesome; treat with an insecticidal soap if necessary. Prevention is also helpful in the form of row covers. Mice and voles like to help themselves to the roots. Plant: Clusters of large green, slightly ruffled leaves with hot pink stems. Flowering: While typically grown as an annual, Swiss chard is a biennial with regards to flowering, and will do so after experiencing a cooling period followed by warmth. May cross with beets. Seeds: Flowers produce fruits containing clusters of seeds. 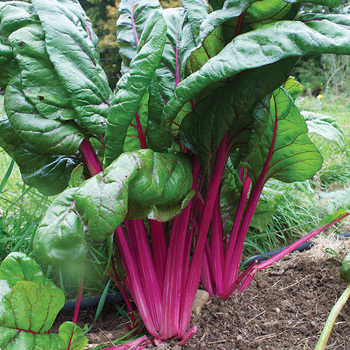 Swiss chard roots can be ovewintered indoors and replanted in the spring to produce seed.